One could easily spend a lifetime exploring Yosemite National Park. Like it's towering glacial-carved granite monoliths and vertigo-inducing chasms, Yosemite's wonders run broad and deep. The park's central Sierra expanse covers elevations ranging from 4,000 to over 13,000 feet and is home to some of the world's most iconic natural landmarks. One of the best places on the earth to see remnants of past ice ages at work, Yosemite offers a front-row seat to understanding how the mountains in the area were formed. But for those seeing Yosemite for the first time, or simply have finite time to explore the area, what are some of the must-see highlights for a shorter itinerary? We're glad you asked as we certainly have some recommendations. Not surprisingly, there are many! Yosemite covers a large swathe of the central Sierra Nevada mountains, stretching west to east across the range from the lower montane foothills to the lofty Sierra Crest. Geographically, the park can be thought of as having six main areas: Yosemite Valley, Hetch-Hetchy, South Rim, North Rim, Tuolumne Meadows, and the park's expansive backcountry. For this shorter itinerary we're honing in on the more accessible areas such as Yosemite Valley, the South Rim and Tuolumne Meadows. Fortunately, these areas also happen to hold some of the park's grandest sights. Given the accessibility of these areas and Yosemite's global appeal, it is important to plan for, or around, crowds. Summer is Yosemite's busiest time of year, and it's no secret that easily accessible areas can feel crowded during this time. For this reason, consider scheduling your trip to Yosemite during a shoulder season, during fall or mid- to late spring to avoid peak crowds and experience a quieter Yosemite (mid-week is even better). High elevation park roads tend to remain open through much of fall and generally open back up by late spring. Finding available campsites in the park during the summer can be difficult unless you plan in advance with online reservations or by stopping at one of the campground reservation offices at park entrances or in Yosemite Valley upon arrival. Below is a suggested 3-day itinerary. These are action-packed days, so plan to pick and choose depending on your energy level or impromptu inklings to explore a particular place longer. Drive times between each area typically range from one to two hours, so plan accordingly. 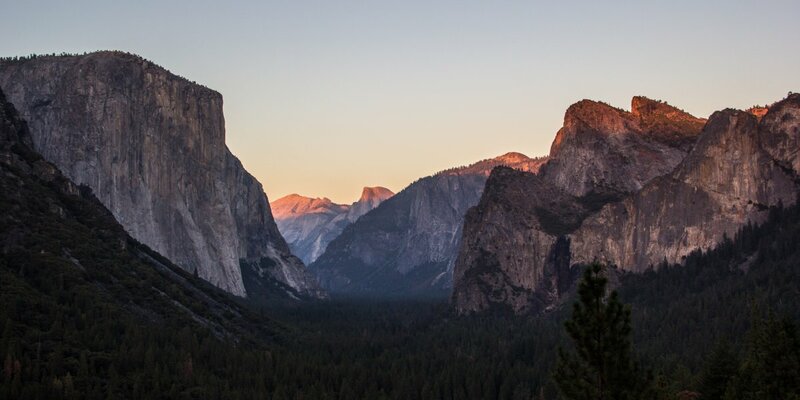 Most visitors enter Yosemite from the west or south entrances, which aligns with the orientation of the below itinerary, but it can be done in reverse order if you will be entering Yosemite National Park over Tioga Pass from the Sierra's east side. Half Dome at Sunrise from Glacier Point. Photo by Aron Bosworth. Try and stay in the park the night before, either at Wawona, Crane Flat, or Bridalveil Creek Campground to get a jumpstart on the day and get close to the South Rim. Bridalveil Creek Campground is the only camping available on the South Rim proper, so that's your best bet. 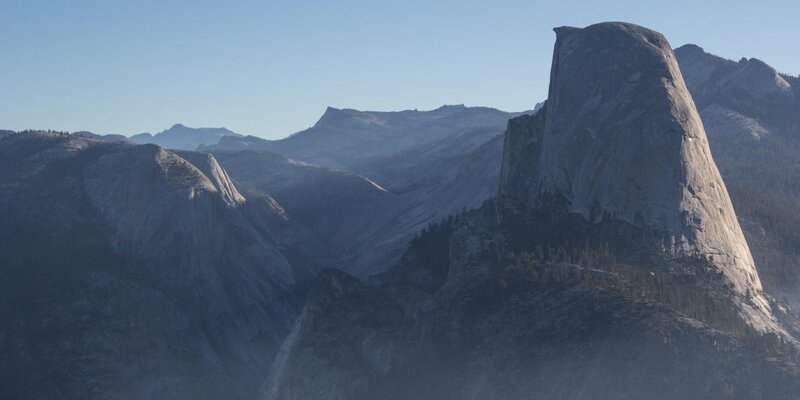 We highly recommend trying to catch the sunrise at Yosemite's favorite vista at Glacier Point. You will not regret missing out on that extra hour of sleep once you see Half Dome lit up by the early morning rays. After exploring Glacier Point, continue back on Glacier Point Road to the Sentinel Dome/Taft Point parking area. Shorter, there-and-back hikes can be done to both Sentinel Dome and Taft Point, or a longer 4-mile loop connects the two. All offer impressive views of Yosemite Valley and the surrounding landmarks. Return to Wawona Road and head downhill to Tunnel View en route to Yosemite Valley. Tunnel View is another impressive viewpoint and a photographer's dream with eastward views framed by the granite walls of El Capitan, Bridalveil Falls and Half Dome. If crowds are thick at Tunnel View, consider heading up the Pohono Trail for a mile or so to access a nearly identical view of the Valley. Wrap up the day by heading down to Yosemite Valley. Stop by the historic Ahwahnee Hotel for a drink and take in the one of the grandest examples of the Park Service's rustic architecture style. Head on over to your campsite at Upper Pines or Lower Pines Campground or join in the collective bustle and fun of camp sharing at Camp 4. Yosemite Valley from Tunnel View. Photo by Aron Bosworth. For this portion of the trip we recommend bringing your bike along as the valley floor is a great place to use it! Start the morning off with a ride through the eastern portion of the valley exploring Cook Meadow, the Yosemite Falls area, and the beaches and bridges crossing the Merced River. Biking is an incredible way to experience the towering monoliths surrounding the valley and avoid dealing with the hassle of car parking. Bike paths lead through much of the eastern portion the valley, and roads link to other highlights such as El Capitan Meadow. Depending on your energy level, choose between hiking up to the falls of the Merced River Canyon via the full Giant Staircase Loop or take a shorter there-and-back excursion to the lower of the two falls, Vernal Falls. If you're ready for more activity or looking for an easier hike, a nice and flat option loops around Mirror Lake, a seasonal lake fed by Tenaya Creek that lies at the base of Half Dome in the quieter easternmost portion of the valley. If you didn't make it to Lower Yosemite Falls on your bike ride earlier in the day (bikes aren't permitted on the path leading to the base of the falls), consider making a final stop here to appreciate the the tallest waterfall in the United States before heading up to Yosemite's high country by way of Tioga Pass Road. If you can make it before dark, stop at Olmsted Point along the way to enjoy impressive views of Half Dome and the granite peaks and domes surrounding Tenaya Lake before continuing onto Tuolumne Meadows Campground. Alternatively, you can sleep at Porcupine Flat Campground (note: potable water is not available here, which also tends to make it less crowded) near Olmsted Point. A valley shuttle provides free transit around Yosemite Valley and stops within walking distance of nearly all major landmarks and trailheads. If you don't have a bike, leave your car parked for the day at one of the lots and use the shuttle to access locations. During summer the shuttle also provides access to Glacier Point. Tuolumne Meadows view from Lembert Dome. Photo by Aron Bosworth. 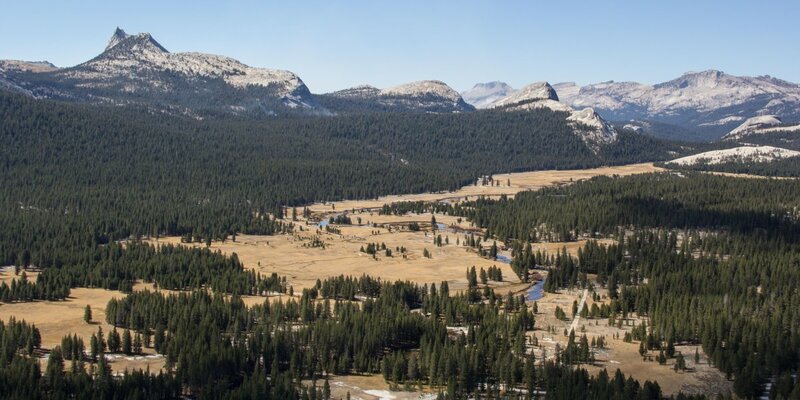 Since you headed up the night before to ensure a full day to explore the Tuolumne Meadows area, you'll be waking up in a prime location to hit the trail. A not-to-be-missed 8-mile there-and-back hike heads up the Cathedral Lakes Trail to Lower and and Upper Cathedral Lakes. A great place for a swim, the scenic lakes below Cathedral Peak are highlights along the early section of the John Muir Trail. If the Cathedral Lakes Trail is a bit more than what you're after, consider a nice flat walk around Tuolumne Meadows itself, the largest subalpine valley in the Sierra. Trails under a mile in length explore the meadow and meander along the Upper Tuolumne River. Head out to the center of the meadow to Soda Springs, where you'll enjoy postcard like views of the surrounding Cathedral Range and Tuolumne's many shapely domes. The Lembert Dome Loop, located across the Tioga Pass Road from Tuolumne Meadows Campground, is a significantly shorter hike to the Cathedral Lakes Trail that gets you up to some of the most impressive views in Tuolumne Meadows. Whenever you're ready for some rest and relaxation during your Tuolumne tour, consider heading a few miles west back to Tenaya Lake. The striking granite scenery and ideal swimming access make this one of the best lakes in Yosemite to spend a few hours on a warm day. Note that a shuttle offers free transit service throughout the Tuolumne Meadows area during summer, including to Tenaya Lake. I wrote a trip report for a 3 day / 2 night trip to Yosemite. We made our base at Crane Flat Campground and did the Clouds Rest and Lembert Dome hikes. We also visited Tenaya Lake and Tuolumne Meadows.